This La Femme long prom dress with illusion deep v-neck is both modern and sleek. The soft mikado fabric is one of many elements that alludes to its current, high-end style. This sleeveless v-neck dress has an illusion inset at the bust that plunges all the way down to the waist, elevating this dimension and slenderizing the body. The a-line shape also cinches the natural waistline in a figure-flattering and stylish manner. The look wouldn't be complete, however, without ultra-convenient pockets and chic, criss-crossing straps that reveal an open back. 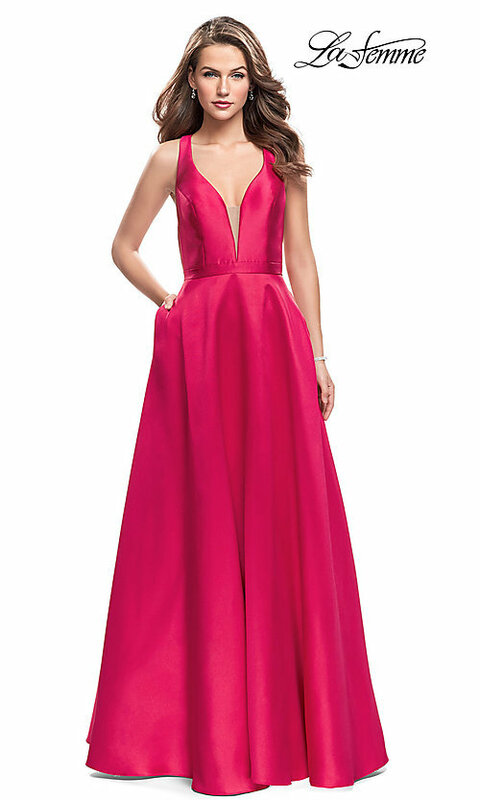 This long prom dress with illusion deep v-neck might be just your dress for prom 2019.